One of my very generous blog readers - in Turkey, no less! (I didn't even know I had regular blog readers in Turkey!) 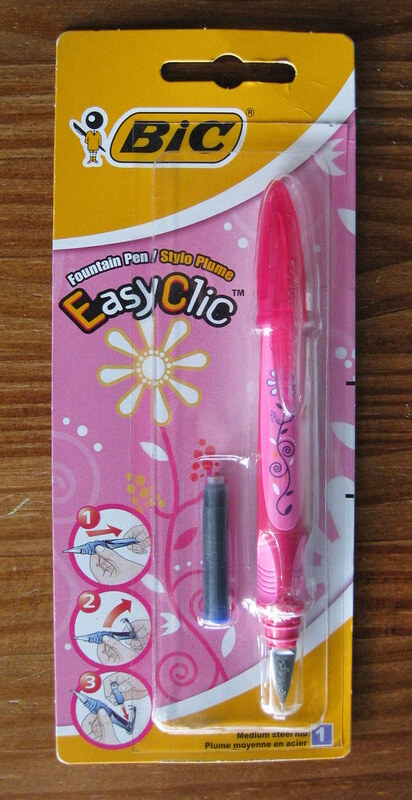 - sent me this Bic Easy Clic fountain pen. I had previously admired it when it was mentioned on The Fountain Pen Network, and bemoaned the fact that it was not available in the USA. So, he just sent me one! 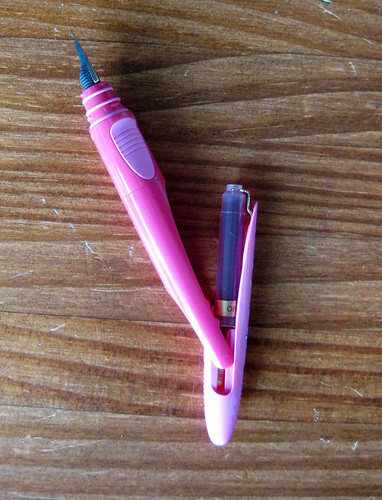 Although pink is my least favorite color, this is a fantastic little pen. It differentiates itself on how simple it is to refill the cartridges, and this is indeed the case. 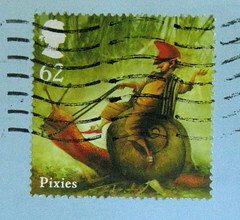 It takes a short international cartridge (in the spirit of Halloween - I received this in mid-October - I decided to use a Diamine orange cartridge instead of the generic color - dark blue, maybe? - that was included with the pen) and once you can figure out how to pull the pen open (requires a specific sort of grip and pull), it's quite simple. So you just drop the cartridge in, and then close the pen. It all fits beautifully, and seems quite leak-proof. 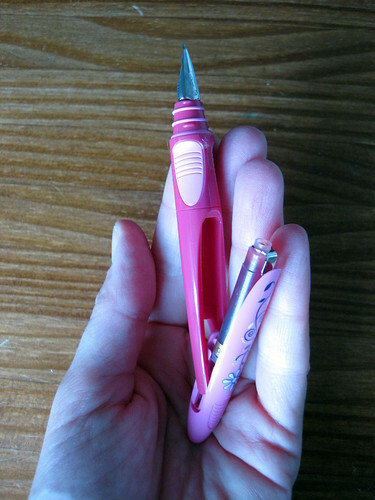 This is a small pen - here it is in my small hands for size comparison. I rather like that aspect of it; I prefer small pens. I wish I had photographed a writing sample - this pen has a simple, medium line. It writes exceedingly smoothly for the price point, and starts up immediately. All in all, I'm incredibly pleased with this pen and absolutely tickled to have received it as a gift. It's a little boring, but here's the back of the package. We now know it was made in France. Whew! Nice to have done a real blog entry post-computer-crash. If the photos aren't as nice as my normal ones, I apologize - I'm editing with Picasa, and haven't figured out a good way to blur out personal info there, so for the time being I'll have to use photos that just don't contain any personal info that needs to be blurred out. Unfortunately there isn't any blur option in Picasa. I'm using Bundled Edition of PhotoImpact 5 for this, but I can't remember where I got it from. I googled for free softwares for blur, and GIMP http://www.gimp.org/ was mentioned in one discussion. The writer said that there is blur option, which isn't called blur but something else. wow what an awesome little pen . pink is one of my fav colors . Thanks for sharing and posting this . I always loved recieving gifts from someone I am writing to. I used to have a pen friend in Brazil whom I exchanged gifts with as well as letters and always loved getting packages from her. I still have some of the things she sent me. oh man!! i love that pen! i wish i had known about it earlier i TOTALLY would have bought one while i was in france this summer! hi, i've followed u. ;-) nice to meet you! It seems that technically, it's not a disposable, since you can replace the cartridges. But How difficult do you think it would be to clean the nib area? I can't tell if that area is removable or not. Sirpa, I believe you may have saved the photos on this blog. Liz - you're right. I guess it's a disposable in the same category that the Pilot Petit1 and Platinum Preppy are marked as such - it's just inexpensive. I haven't tried cleaning the nib yet; looks like you can run it under water but I suspect you are correct in that it's not easily removable. I am bemoaning the fact that I did NOT buy one of these the last time I was in Paris, which was March of this year. I looked at it at BHV a few times and just walked away. What was I thinking!? Grrrr, on myself. Thanks for sharing the images. What a cute little fountain pen! I have some of the Pilot Varsity fountain pens and liked them well enough. But, here in our small town, even those aren't available. Last weekend, we went to visit my parents, and I had a chance to go to Michael's. I bought an old-fashioned dip pen and nibs. I used to have one (and still probably do somewhere) that I used for calligraphy, but I wanted some fine-point nibs for writing. Now, I need to get an inkwell! Wow! How fun is that? I need to get me a fountain pen. I am from the United States and I am having a horrid time trying to order ink for my Bic Easy Clic. The Bic webpage said ink is only available in Europe and Africa. Neither Amazon not Ebay has the ink to fit in these amazing fountain pens! I'm so sad my ink is gone! I just want some more! Any suggestions? anyone know where I can get the refills? Mari, it's too bad I can't view your profile - I would have emailed this directly to you. You can use any short international cartridge in a Bic Easy Clic. I'd suggest you check out some more info on the Fountain Pen Network (linked above in original blog post), but the short answer is that ink cartridges made by Private Reserve, Diamine and J. Herbin will all fit in these pens. I refill a cartridge with a plastic pipette. You can buy Private Reserve, Diamine, and J. Herbin cartridges from a huge array of online retailers in the USA, and possibly at a pen store near you, depending on where you live. Cute-looking pen. Only thing I don't like about living in the U.S. is that so many fountain pen manufacturers think there's little to no market for their products here. Maybe if they advertised fountain pens the way Sanford's done with Sharpie, they'd find out they're wrong. A France made fountain pen, it's really good to see such nice pen! I really enjoyed reading complete review of Bic easy clic fountain pen. It's cute looking one indeed. Looking forward to give it a try.